Charles Darwin’s last book bears the unusual title The Formation of Vegetable Mould Through the Action of Worms. It was published in October of 1881 and in it Darwin focused on the myriad ways in which many of the earth’s smallest creatures can, over very long periods of time, change the face of the planet. How in the world … you must be thinking … can this have anything to do with a bicycle ride along P.E.I.’s Confederation Trail? 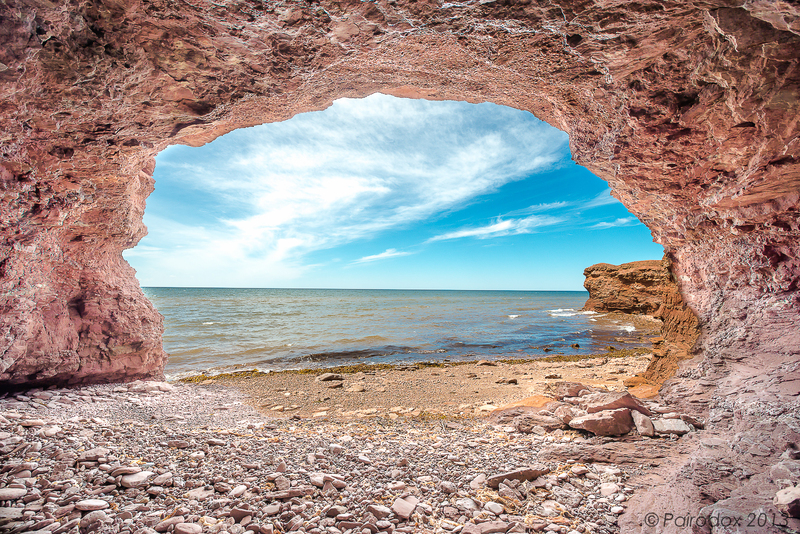 The bedrock which forms Prince Edward Island is composed of sandstone, a highly erodible (sedimentary) rock. The Provincial government there has estimated that coastal erosion currently occurs at a rate of between 0.5 and 1.5 m per year. In contrast to the time scale upon which Darwin’s worms influence the formation of vegetable mould (what we call soil), the effects of ocean storms along the coast of P.E.I. must be visible to the careful observer. Joanna and I reached North Cape on day five of our adventure. Because the bike trail took us through the interior of the island we hadn’t seem much of the coast and so took time at trail’s end to visit the ocean and to look around a bit. What impressed us most were the beautifully sculpted red sandstone faces which lay exposed along the shore. The ground at the North Cape Wind Energy Interpretive Centre is fully 10 meters above sea level, and this leaves plenty of surface upon which the erosive force of the ocean may work. We were eager to explore. The shallow cave from within which the image below was taken may have backed 5 m into the bedrock. Leaning against its cool back wall provided a nice view of blue skies and puffy white clouds out over the Atlantic. Click the image to view a larger version with higher screen resolution.